Do you love strawberry milkshake so much that you wish you could just swim in it? Well, here’s your chance, buddy. 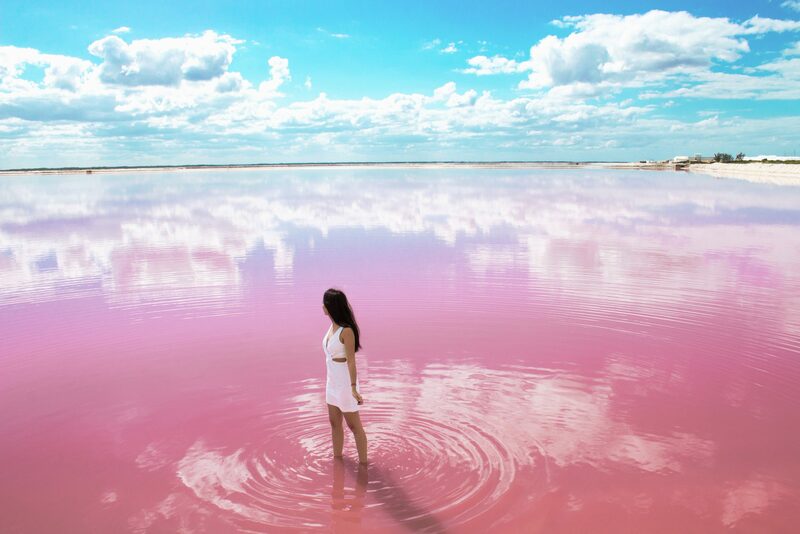 Hidden away on the tip of Mexico’s Yucatan Peninsula is a surreal place with pink lakes surrounded by salt dunes known as ‘Las Coloradas’. 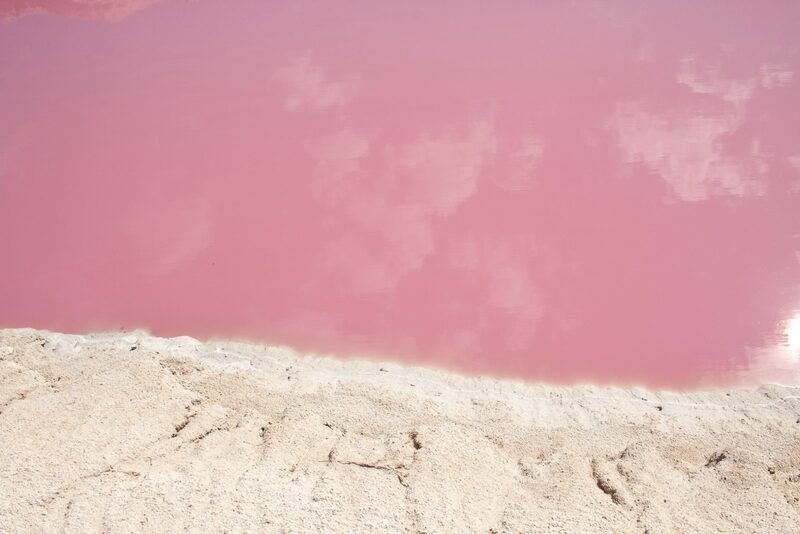 That’s right, pink lakes – as if the Mexican Riviera wasn’t stunning enough. The unusually colored lagoons appear utterly bizarre, as if someone had tipped in a load of pink dye while no one was looking. However, they’re actually a completely natural phenomenon that somehow provides livelihood to the local people. Las Coloradas is in fact also the name of the close by tiny fishing village, and the whole area is a part of the Río Lagartos Reserve, a protected space residence to cute animals like flamingos, crocodiles, sea turtles and sea birds. SO WHY EXACTLY IS THE LAKE PINK? To add to the fantasy of the pink lakes, the reason for its unusual coloring is as yet unknown and under investigation. Most scientists believe that the color comes from a dye that is created by bacteria, a certain Dunaliella salina. Sounds legit to me. Supposedly, once the lake water reaches a certain salinity level and the temperature rises high enough, the reddish pigment begins to accumulate in these micro-algae. As the water evaporates, these organisms become more concentrated, glaring pink in the bright Mexican sunlight. Phenomenal! 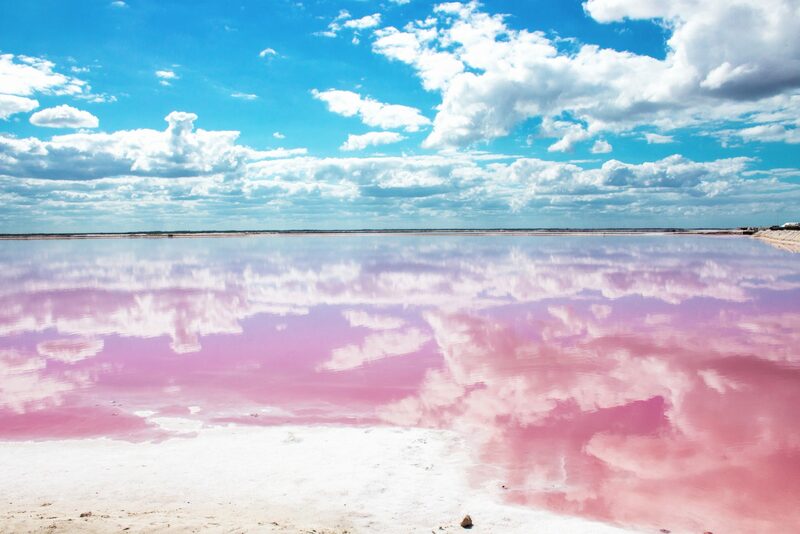 Pink lakes are very rare wonders around the world. Some of the most famous include Ukraine’s Lake Koyashskoe, Tanzania’s Lake Natron, and Senegal’s Lake Retba. 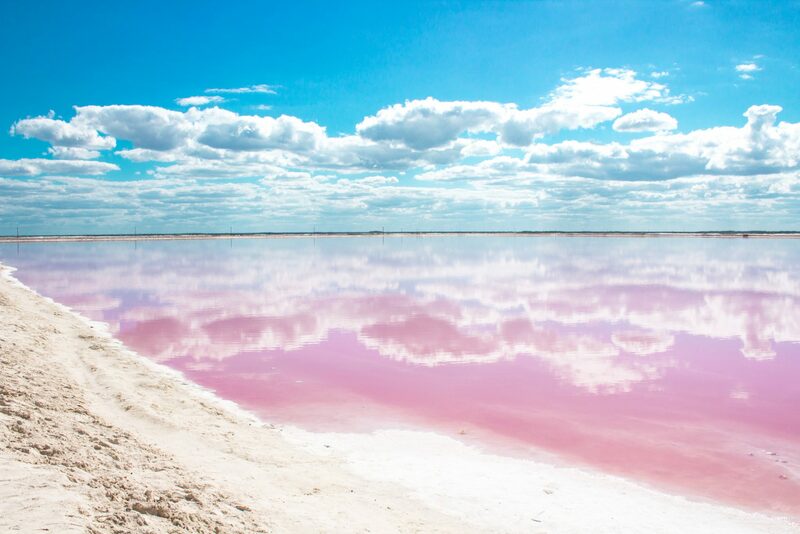 Australia boasts two famous pink lakes, Lake Hillier and Hutt Lagoon. If you were to compare all of these pink lakes, you would find one interesting factor in common: they’re all salt lakes. 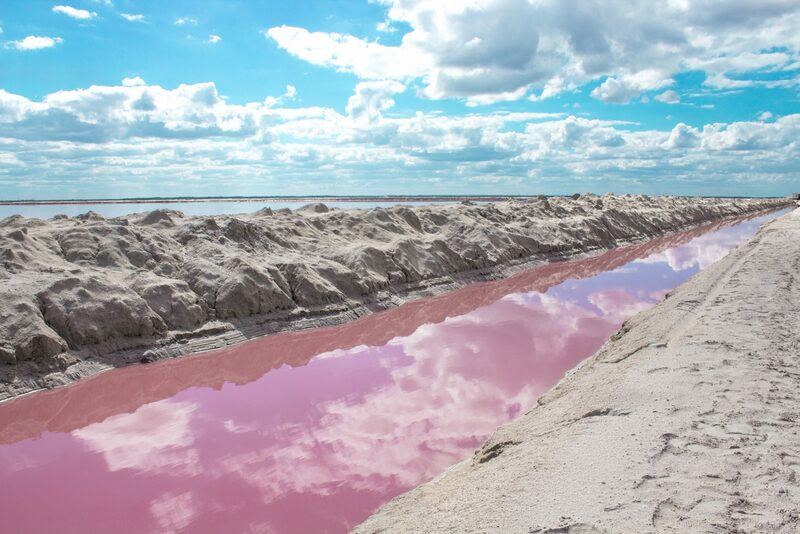 The huge piles of white stuff surrounding the Las Coloradas lakes are in fact salt, which is actually shipped to kitchens all over the country. That’s crazy beautiful mother nature right there. The pictures taken in this area all look like they’ve been photoshopped, but the water really is a vibrant bubble gum pink. This lake is just naturally and breathtakingly beautiful. For a second you would not believe that something so wonderful can exist in the world. WHERE IS THIS BUBBLE GUM LAKE? 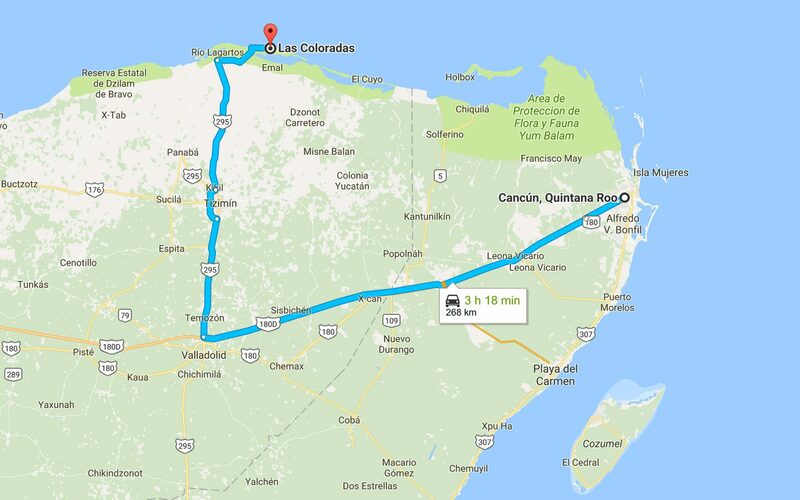 Assuming this is a real place and I didn’t just dream up everything, getting to Las Coloradas requires a three hour drive from Cancun. Well, no one said it would be easy. And take time to make a good playlist before you leave, as the highway from Cancun feels so endlessly straight that it can get boring. Along the way you can stop in Valladolid, a small but pretty, pastel-colored colonial city. As you head north from Valladolid, the drive through the Yucatán countryside becomes more interesting and scenic, especially after Tizimin. Once you reach the coast, you can stop to see the beaches, where you will see nothing but dunes, sea and miles of pristine coastal landscapes. The second stop along the road is the salt factory, surrounded by huge mountains of salt gleaming in the sun. After the mountains, drive a bit further to find the pink salt pools and the fishing village. To be honest this place was nothing like I imagined it to be. It turns out it is a privately owned salt mining factory, and the village has about 1,000 inhabitants who usually work in fishing and with salt. However, the lack of tourists makes all of his scenes feel somewhat more magical. Las Coloradas (the village) has no actual lodging choices or tourist infrastructure, and most vacationers keep within the close by city of Rio Lagartos 30 minutes away or Valladolid 50 minutes away. You can also simply go for a day-trip with a rental car from Cancun, like I did. Just Pack a picnic lunch. And a bottle of Rosè. CAN YOU SAFELY SWIM IN THE PINK LAKE? The answer is….kind of. The lake has never been shown to produce any adverse effects on people. The pink water is extremely salty, so it may well sting a bit, particularly when you have cuts. Also the lakes are solely about eight inches deep, so maybe don’t try to do a cannonball. Now it’s over to you! Have you ever seen a pink lake? Do you like pink stuff? How many times did I use the word ‘pink’ in this post?? Let me know in the comments. For now, adiós!